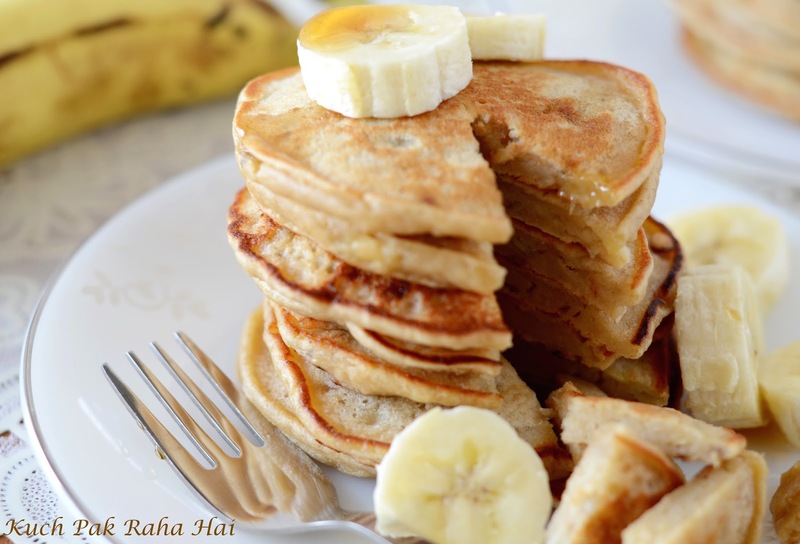 "Whole wheat Banana eggless pancakes" is a healthy and delicious recipe for making pancakes everyday. 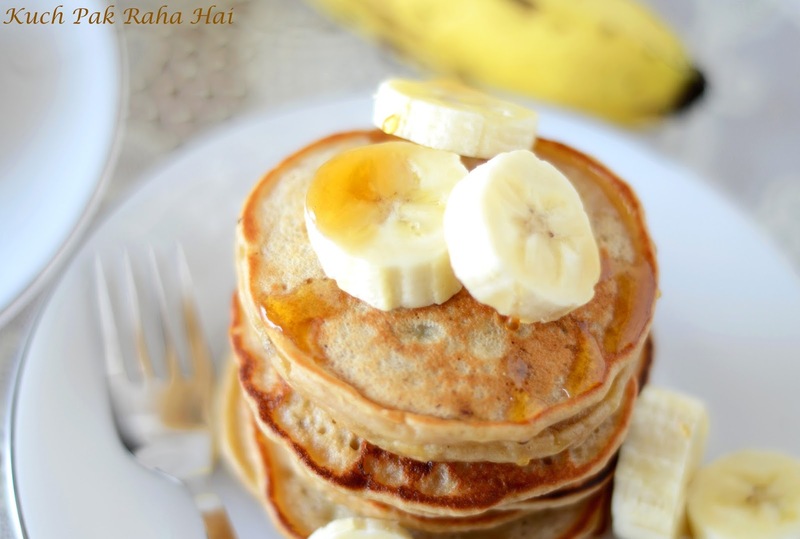 It combines the softness, fluffiness of pancakes with goodness of whole wheat, bananas and milk. 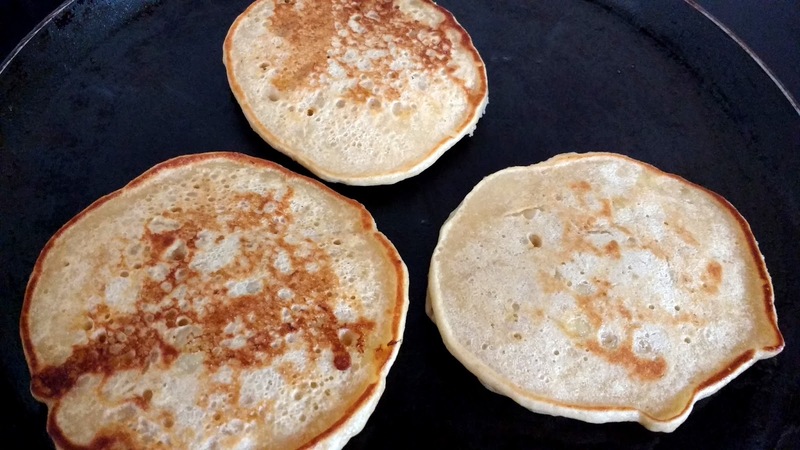 As this recipe does not use eggs, it is a 'must' try for all those vegetarian people who are constantly searching for yummy and melt in mouth pancakes recipe. I had made multiple attempts before coming up with this bang on pancake recipe.The ingredients used in making these pancakes are very basic and easily available in kitchen pantry. They are really quick and easy to prepare which makes them a perfect choice for Kid's tiffin and breakfast. The three main ingredients which makes these pancakes wholesome are whole wheat flour, bananas and milk. It is nutritious not only for kids but also for adults. Bananas are good source of vitamin C, vitamin B6 fibre and potassium; & Milk is rich in calcium, vitamin D and vitamin B12 etc. 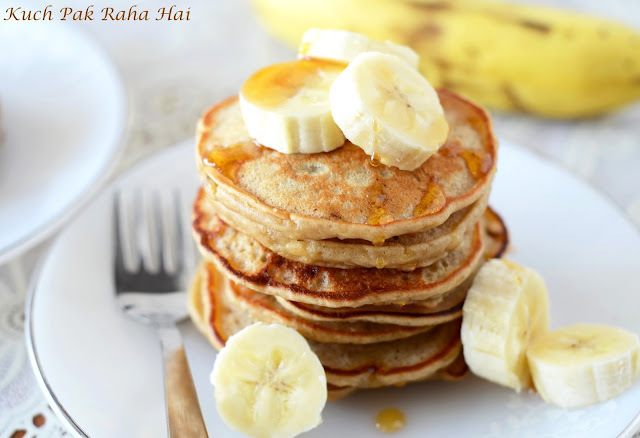 The goodness of bananas and milk when combined with whole wheat flour make them an ideal choice for starting your day. Consumption of 2-3 pancakes as breakfast in morning will not only make you feel full but also provide you with the necessary energy for kick-starting your day. As per various health journals and articles, breakfast must never be skipped in the morning as it slows down the metabolism rate making you feel weak, dizzy or bloated for the entire day. My efforts have been towards making this recipe as healthy as possible without compromising on the texture and taste of the pancakes. 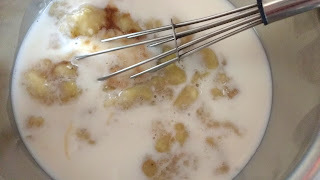 I have used brown sugar and ripe banana puree for the sweetness. More the bananas are ripe more they will be sweeter, hence adding natural sweetness to the pancakes. Hope you all will like this recipe!! Whisk together all the wet ingredients i.e. milk, banana puree and vanilla essence with the help of a beater (buy here). 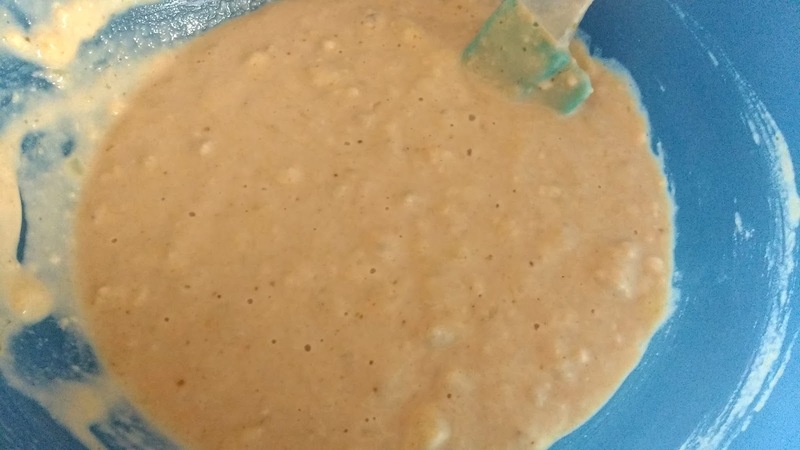 Take whole wheat flour in a mixing bowl. 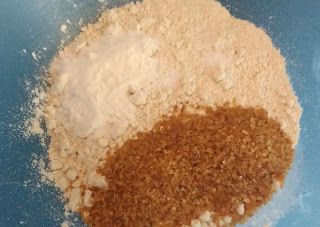 Add salt, brown sugar and baking powder to it. Mix well. 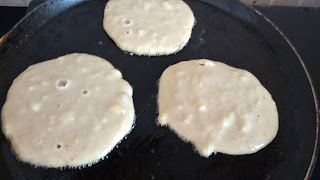 Place griddle on low flame so that it is ready for spreading the batter by the time we mix wet and dry ingredients. Mix together all the ingredients of step1 and step2 gently in order to form a uniform thick batter. Brush some melted butter on the griddle. As I want all my pancakes of the even size, I am using an ice cream scooper (buy here) for shelling out the batter. Spread the batter in order to form thick pancakes of roughly 4 inches diameter. Cook the pancakes on Medium-Low flame. 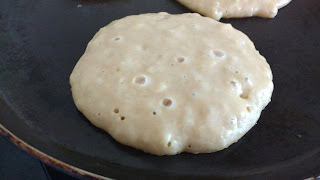 Once small holes appear on the pancakes, flip it. Let it cook from other side for 1-2 minutes. Repeat till you get golden brown colour on both sides. Nice presentation and good recipe. Will give it a try soon! Very simple receipe but can I use regular sugar instead of brown sugar? Hello Riddhi, yes you can use. Your suggestions and feedback are valuable. 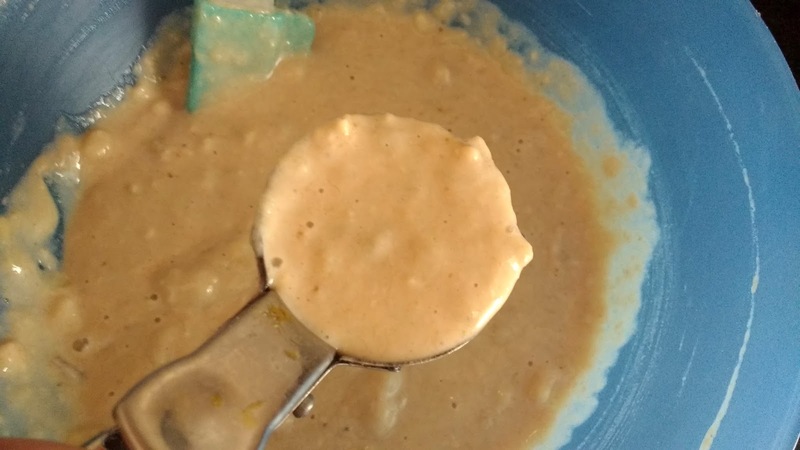 I would love to hear from you if you have tried and liked any recipe. Your suggestions are always welcome and appreciable. Feel free to drop in your feedback in the comments section below or you can also send message/food-pictures on our Facebook page KuchPakRaha Hai. Eat, Drink and Be Merry!! !